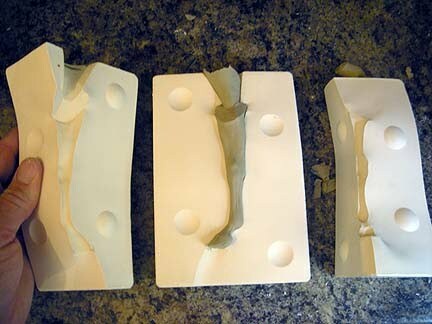 I can’t get over how perfectly and elegantly it casts in the mold! Now I have something new to do, on the next rainy day. Which will be tomorrow, ha ha. July was one of the rainiest on record for England, so I am learning to love rain. 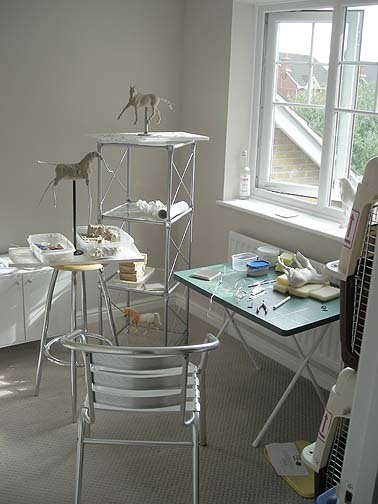 Here is a photo of my Art Room. For some reason I am calling it the Art Room rather than the studio, maybe because it really can’t compare to my wonderful work space at home in Boulder. Also, it is utterly stark and impersonal because I don’t have my usual collection of Karen-things sitting all over the place like I do at home. (I’m resisting the temptation to buy little souvenir-y things… but I’ve already started down the slippery slope with a Lilliput Lane model of Windsor Castle! A Must Have, Windsor is our “local” castle after all!!) I should at least get a cork board so that I can stick up photos and things. Anyway, the room will serve. The house faces northwest so this room is bright all afternoon, when I’m most in the mood to do art work. I can see the street and the park from the pretty window, and watch vintage airplanes go in for a landing at the airport on the other side of our neighborhood. It’s a pleasant place and being upstairs, it should be warmer in winter! I share the space with the Boyz’ stored kennels and the ironing board. In the spirit of not buying a lot of stuff we’ll have to ship back to the US in 2 years, I cobbled together most of the furniture from discount stores. The aluminum chair is from the patio set that came with the house! I think I’m going to make a big turn in my original plans for my work life while here. 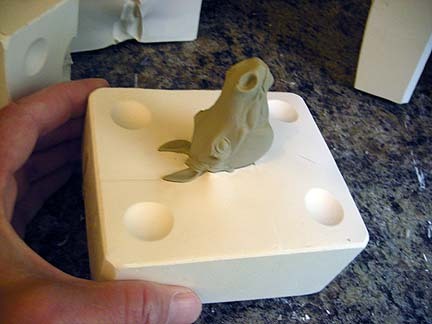 It is becoming obvious that doing slip-casting isn’t going to take years to learn, and I don’t need to learn it here for any particular reason. 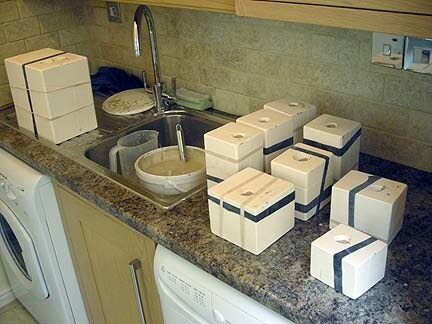 It isn’t practical to get a kiln (and I’m completely burnt out from glazing) so the chances of glazing to finished pieces are slim to none. 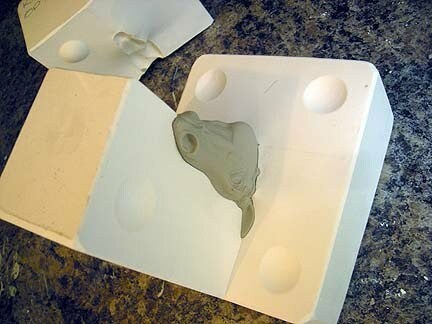 I should not work the molds here, and then have to get all those made chinas home. 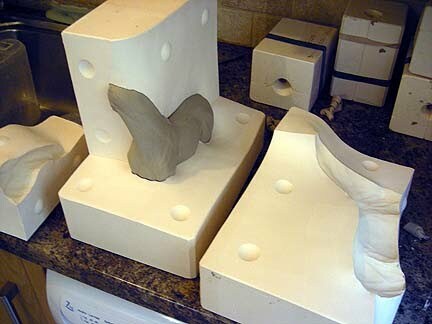 Far better to just take the molds home with me in 2 years, and then make china horses from them in the ideal situation of my Colorado studio, with kiln in house, for years to come. 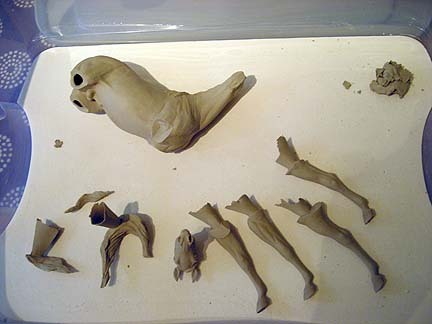 So what I’m going to do instead, is sculpt. I can tell I’m finally ready. I’m seeing horses every day, and the beautiful countryside is so energizing. I can practically feel my artistic spirit lifting up just imagining that I’m seeing some of the same kinds of things that inspired the great old masters who lived here or traveled and worked here. 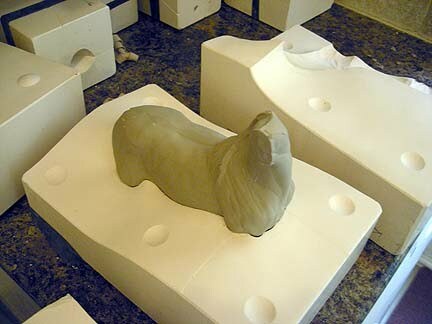 Any new sculptures that I finish here, I can have molds made for ceramics here, too. Next week we’re off to Land’s End, Cornwall, for a week. We’ve been putting our weekends to good use as tourists, too. We’ve ridden our bikes on an old barge canal near Bath, and around Oxford, and all along the Thames. A couple weekends ago we took a Friday afternoon off and went in to London. The Summer Opening of Buckingham Palace had just started (you can only tour it for these 2 months a year) so we decided to do that. It was pretty impressive and very well done. I was especially excited to see all the great paintings in the Queen’s collection. More Canaletto’s and Rembrant’s to tick off the Seen list! We also went to an art museum called The Wallace Collection. This art museum has the most incredible collection of art and I never heard of the place!! I was thrilled to see this superb equine painting by Landseer, The Arab Tent. (I’m buying a large print of it for my studio at home, to match the Whistlejacket.) And more great Dutch Italianate landscape paintings, my favorites! Oh, and I’ve found a great doggie-swimming spot on the banks of the Thames, for the Boyz. Kit was in water-dog heaven! Must get back there, next sunny day! 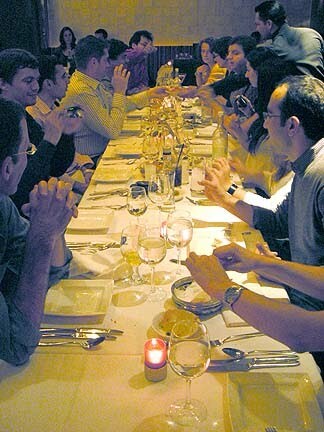 Here are photos of our group at the dinner, and Paul sipping his Raki, the favorite Turkish alcoholic beverage! 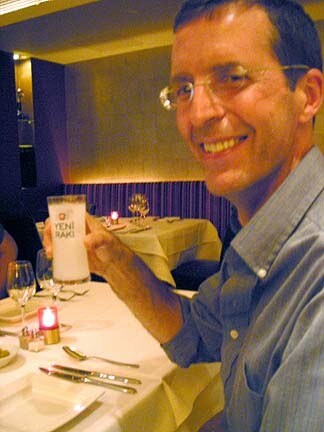 Paul is almost certain to have to spend several weeks in Istanbul this Fall, and the Turks are all ready to play host to us if I come to visit while he is there. If the timing works out, we are probably going to go to a wedding there. I am very excited about being able to see the real local’s Istanbul with someone who knows the place, instead of just using a guidebook. I think being here is going to be such a world-widening and mind-opening experience for us, I feel so very fortunate.